Old Home - Willis Henry Auctions, Inc. Parking for the Radisson is to the side of the hotel (north lot) and to the rear. 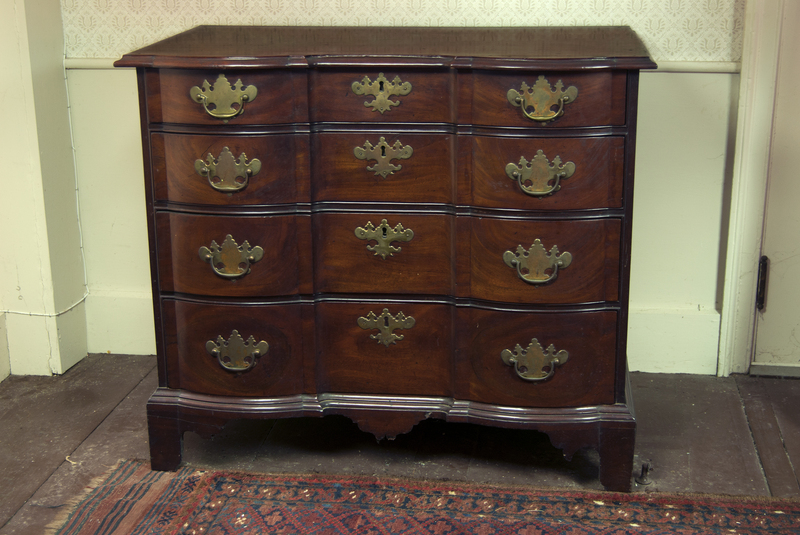 A highlight from our upcoming late winter auction is this fine Boston Chippendale carved mahogany blockfront chest of drawers descended through the Lombard family of Scituate, MA. Dr. J.P. Lombard purchased this chest from descendants of the Stillings family of Portsmouth, NH in 1901. General Lafayette stayed with the Stillings family when he visited Portsmouth in 1824 or 1825. Eastern Massachusetts, circa 1760, molded oblong top above a conforming shaped case with four graduated drawers, above a molded skirt with a shaped drop pendant on carved bracket feet, old brasses (appear to be original), 30 1/2″ high, 33 1/2″ wide, 18″ deep. Collection of painted furniture, primarily blue painted pieces; Collection of lighting; Nautical: whaling harpoons, teeth, prints, nautical andirons; ship paintings; Primitive 19th c. folk art paintings: Prior portrait; Hingham signed woodenware painted pieces, firkins & pantry boxes, many from J.P. Richardson collection, (also leather bound books); Treenware from Affler collection, many pieces in original blue paint; Folk Art; Advertising tinware; Decorated & grain painted boxes; Redware collection inc. many Bristol County pcs (some in boxes not opened since 1976); Stoneware collection; Collection of baskets; Collection of coverlets, quilts, samplers; Reverse glass painted mirrors; Hanging cupboards, shelves, wall boxes, many in original paint; Shelf clocks, Fire bucket; early Delft; Oriental rugs, etc. Click here to view our auctions before September 2012.